Background : Full name is Rupert David Allan. 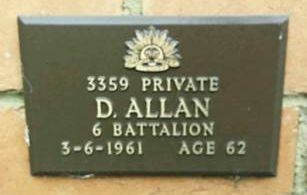 Served in World War 1 as Private 3359 with 6 Battalion. Munitions worker (lathe worker, machinist). Enlisted with date of birth 02/08/1902. Transferred out of 2/2 Pioneers 16/02/1942. Service & personal summary At enlistment : married. No previous military experience. At discharge : height 5 feet 6.5 inches, blue eyes, fair complexion, brown hair. Marital status : married. Dependent children : 1 16 years & older. Marks / scars : tattoo heart left forearm. Full time war service : A.I.F. 28/05/1941 to 24/10/1945 which included 1611 days active service (1290 days within Australia & 150 days overseas). Operational service : Middle East area (embarked from Australia 02/11/1941, disembarked in Australia 31/03/1942). War badge no. A167394. Discharge certificate no. 288618. 28/05/1941 Taken on strength Recruit Reception Depot Royal Park, Victoria. 30/05/1941 Granted leave without pay 30/05/1941 to 05/06/1941 inclusive. 06/06/1941 Rejoined unit from leave without pay. 18/06/1941 Transferred to Engineering Training Depot (Pioneer Wing) Puckapunyal, Seymour, Victoria. 19/06/1941 Transferred from Recruit Reception Depot. 27/06/1941 Evacuated to Rehabilitation / Geriatric Hospital Caulfield, Victoria. 27/06/1941 Admitted with abdominal colic. 03/07/1941 Discharged to Recruit and Training Camp Caulfield, Victoria. 03/07/1941 Rejoined unit from Recruit and Training Camp. 03/07/1941 Transferred from Rehabilitation / Geriatric Hospital Caulfield, Victoria. 15/08/1941 Promoted to acting Corporal Bonegilla, Victoria. 26/08/1941 Promoted to acting Sergeant. 27/10/1941 Posted to Reinforcements 2/2 Pioneer Battalion Bonegilla, Victoria. 02/11/1941 Embarked Sydney, New South Wales on H.M.S. Queen Mary (H.M.T. L.L.) Convoy 13. 02/11/1941 acting Company Sergeant Major Draft 4th and 5th Pioneer Reinforcements. 16/02/1942 Marched out to 2/1 Pioneer Battalion. 20/02/1942 Promoted to acting Corporal. 12/03/1942 Embarked Middle East on U.S.S. West Point. 31/03/1942 Disembarked 4 Military District (South Australia). 25/07/1942 Transferred to 14 Australian Lab Company 1 Military District (Queensland). 25/07/1942 Marched in. Transferred from 2/1 Pioneer Battalion. 01/07/1943 Appointed paid Lance Corporal. 01/07/1943 Clarified proficient as from 01/07/1943. 04/07/1943 Attended Hygiene Inspectors Course. 14/07/1944 Medical Classification "B" constant pain - unfit service outside Australia. 02/11/1944 Transferred to 9 Australian Works Company. 02/11/1944 Transferred in from 14 Australian Works Company. 30/04/1945 Evacuated to 128 Australian General Hospital, Queensland with dyspepsia Not Yet Determined (N.Y.D.) and transferred to X list. 14/05/1945 Discharged 128 Australian General Hospital, Queensland to General Details Depot, Queensland. 15/05/1945 Rejoined unit from General Details Depot, Queensland. 16/05/1945 Appointed paid Lance Corporal. 01/06/1945 Marched out to New South Wales Lines of Communication area. 21/07/1945 Evacuated to 12 Australian Camp Hospital, New South Wales with infected chin. 11/10/1945 Transferred to Leave and Transit Depot, Victoria for discharge. 18/10/1945 Marched in for disposal. 22/10/1945 Marched in for discharge ex Leave and Transit Depot.